Easy to tie, doesn't slip. Very dependable. 1) Double a 12" to 15" length Line/Spectra and pass the loop through your terminal tackle. 2) Put it through the eye twice if you can. 3) Make a simple overhand knot. 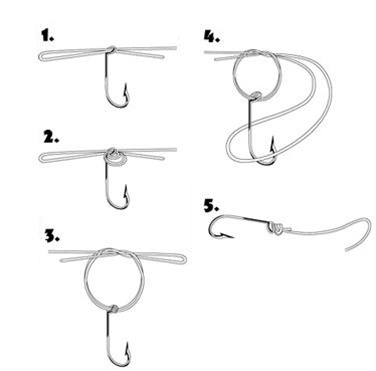 4) Pass your terminal tackle through the loop. 5) Tighten the knot by pulling on the tags, and trim.